The premises benefits from an excellent trading position, being prominently formed to the east of Clarkston Road, adjacent to Cathcart Railway station and within the Cathcart area of Glasgow, approximately 4 miles south of Glasgow City Centre. Clarkston Road forms a main arterial route leading through the popular southside of Glasgow, and runs from Mount Florida/Cathcart to the affluent areas of Muirend, Netherlee and Clarkston. Newlands and Battlefield are also located close-by, with large numbers of resident population in both. The property is within a short distance of Scotland’s national stadium, Hampden Park, which hosts regular substantial events including music concerts and sporting events. The unit is well located in terms of public transport, with regular train services from Cathcart railways station, which is immediately adjacent, as well as numerous bus services running along Calrkston Road and Holmlea Road. The surrounding area is characterised by tenement buildings and is therefore densely populated, with a number of independent and national traders located close-by in Holmlea Road and Clarkston Road. 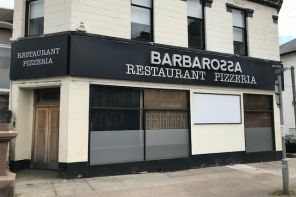 The premises form a ground floor restaurant unit, accessed via two separate entrances from Clarkston Road and enjoying a prominent frontage offering excellent signage opportunities. Internally, the space has been arranged to provide main restaurant area with split lower and upper levels, fully fitted kitchen area, male, female and disabled toilet facilities and cellar at basement level. The main restaurant area is fitted to a high quality contemporary standard and benefits from a dual entranceway from both the north and south of the space. The floor is of polished hardwood, with plastered and painted walls and ceilings, and the area contains bar and kitchen servery counters finished in marble and polished granite. This contains fixed bench and loose seating as well as tables. There are further restaurant areas at mezzanine and lower level and again these are fitted to a high- quality standard, with contemporary fit-out. These can be used in conjunction with the main restaurant area, although equally could be used as separate private dining areas for larger parties. The kitchen area has been fitted to a high standard with fixed sink and WHB units and a stainless- steel extraction hood. This contains good quality kitchen equipment, further details of which can be provided to interested parties. The toilets are attractively decorated and are fitted to a good standard with modern units throughout. In addition to the above is a cellar suitable for dry storage and wet stock, this being accessed via a stairwell formed to the south of the main restaurant area. Heating is via a gas fired central heating system and all mains services are provided.